The RMDE is all about bringing together automotive journalists in the Rocky Mountain region to drive the best that manufacturer's have to offer on roads whose backdrops include some of the most beautiful scenery Colorado can muster. Sometimes, there are pretty women to ride along as well. The first day of RMDE began with registration and breakfast at the headquarters hotel near the Denver International Airport. We were assigned our cars for the first leg of the drive, which would take us out of Denver proper and south towards Colorado Springs. This mix of suburban and highway driving was a great chance to try a vehicle in a mixed environment. I was assigned the Jaguar XF 3.0 AWD, but because I'd already driven that car before, I traded with another journalist for a chance in the all-new 2014 Chevrolet Impala. My drive in the Impala was co-piloted by GM's Shad Balch, Assistant Manager, Environment, Energy Policy & Communications, West. He gave me a quick run-through of the substantial changes the company has made to its high-selling sedan. Most of these improvements are to the interior, though there has been an exterior re-design as well. Buyers of the Impala, frankly, are not about the car's looks, they're about its comfort level and easy drive. For the most part, the Chevrolet Impala aims for that half of the automotive market that wants a sensible, cushy, full-sized sedan with an emphasis on comfort and safety. The Impala nails that perfectly. In the previous generation, the interior accouterments were becoming dated and outclassed by the competition. This upgrade changed all of that with improved premium styling, upgraded electronics, and a smoother feel. Thanks to improvements like electric-assist steering, better aerodynamics, and the smart use of technology, the 2014 Chevrolet Impala achieves a good blend of power, economy, and comfort at a starting price under $27,000. Pictured above, my second drive of the day was the Infiniti M35h. The M Hybrid comes in several options, with our vehicle being the 3.5-liter V6 Hybrid powertrain. This mixes power output and efficiency in a full-sized sedan package that achieves 32 mpg on the highway and 27 mpg in town. Few will complain about the 360 net horsepower rating either. My co-pilot was the lovely Alexandra Amelang from Infiniti, who happily showed me the many options and improvements made to the new model year. The car is an exceedingly comfortable cruiser, even in the mountain passes we went through on our way towards Colorado Springs. It climbs well, gives intuitive hints as to how eco-conscious your driving habits are, and lives up to the quality that this premium brand has become known for. 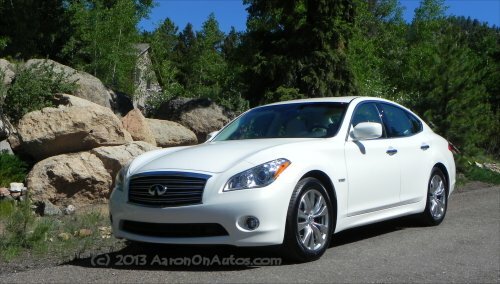 The Infiniti M Hybrid's base price is about $54,000 and as driven, it was $66,245. To begin with, I was unsure of what to expect out of this car. It has the same powertrain as the tiny 500, but is a vehicle of about twice the size. I expected it to drive like a bus with an even worse throttle response. Instead, I was pleasantly surprised to find that it is peppy, exceedingly roomy, and drives well considering its girth. Far from being a minivan in handling, the 500L is nicely done. My drive was accompanied by Fiat's Nicole Longhini-Mcelroy, brand manager for the 500L and 500e. To Chrysler's credit, they have a penchant for hiring beautiful redheads and Nicole is no exception. She is also knowledgeable and personable and our drive was both informative and fun. We opened the huge canopy moonroof and rolled down the windows for a pleasant cruise up the mountain as she occasionally lifted her camera out the open top to snap photos of the scenery. For the family who needs some space, but doesn't want to give up the fun factor and distinctive Italian style and sound of the Fiat 500, the 500L is an excellent choice. The 500L got us to lunch, where we were treated to excellent food and a scenic overlook of famous Pikes Peak, whose International Hill Climb commences next week. The VW Jetta is a popular small car for many reasons, not the least of which are the numerous and often understated powertrain options offered in the platform. The Jetta is available in gasoline, diesel, and gasoline-electric hybrid format. The Jetta itself is a well laid out compact that has a larger interior than most would expect. The rear seats are somewhat cramped, but manageable and the cockpit is very ergonomic. The Jetta Hybrid offers the driving experience of the standard Jetta four-cylinder with a seamless hybrid option that boosts MPG to a whopping 48 on the highway. Its 1.4L 4-cylinder engine is a pretty good goer, but adding the boost of the electric motor makes it an easy hill climber. At a base price of just uder $25k, it's hard to go wrong with this car. When I first saw the Mazda6 at the Denver Auto Show earlier this year, I was very impressed and couldn't wait to get my hands on one to drive it. This was my chance and I took it heartily. Sadly, the lovely Halie Schmidt, Mazda's representative and a fun conversationalist, had returned to the hotel from lunch to work out details for our second day on the track, so I had to go it alone. The Mazda6 was everything I'd expected and more. As the only true contender to the Ford Fusion in the mid-sized market for premium styling, the 6 is definitely one to watch. It achieves similar fuel economy to the EcoBoost options in the Fusion through Mazda's SKYACTIV technology, but improves on the Ford in driving dynamics, to which the Ford responds with a slightly better interior layout. At similar price points, few will find themselves disappointed with either vehicle and the Mazda6, being my final drive of the day, was well-received as a comfortable ride for the last 100 miles to return to our hotel. It is responsive, peppy cruiser that achieves 38 mpg highway easily and at a price point under $30,000. I look forward to the diesel option. Next, we will look at Day 2 of the RMDE, which featured time on the race track with the Viper SRT, Nissan GT-R, and some road time in the Chevrolet Cruze Diesel and Fiat 500e electric.